Create a symmetric circulant matrix H based on shifts of the vector [3,6,2,14,2,6,3], with 14 being on the main diagonal. Have the matrix be n-by-n, where n = 30,000. View the sparse matrix structure. Create an optimization variable x and problem qprob. Create the objective function and constraints. Place the objective and constraints into qprob. Solve the quadratic programming problem using the default 'interior-point-convex' algorithm and sparse linear algebra. To keep the solver from stopping prematurely, set the StepTolerance option to 0. 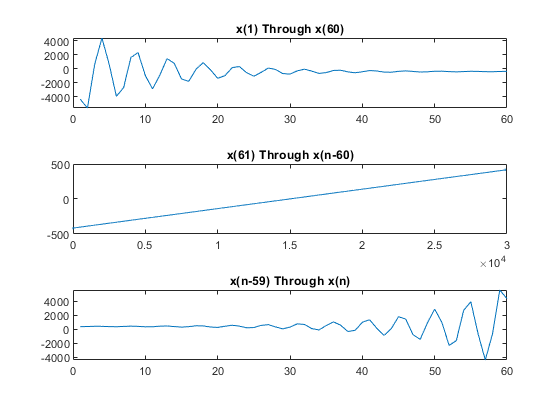 View the objective function value, number of iterations, and Lagrange multiplier associated with the linear inequality constraint. Evaluate the constraint to see that the solution is on the boundary. 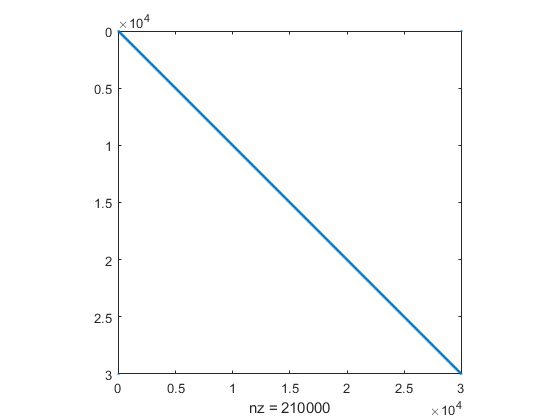 The linear inequality constraint sum(x) has value 7.599738e-09.